The last train left the platform of Lismore, north coast NSW, in May 2004. Like so many regional towns in Australia, the train station was a thriving centre of activity and the lifeline of the community. The history of the Northern Rivers region is written on its tracks – from the arrival of early settlers, the post-war immigrants, the Aquarius hippies, the returning soldiers and young people leaving the town in search of work and adventure in the big cities. Lismore’s train station is steeped in the stories of regional Australia. As part of the development of Railway Wonderland, NORPA collected stories and images that give an insight into the history of our community. 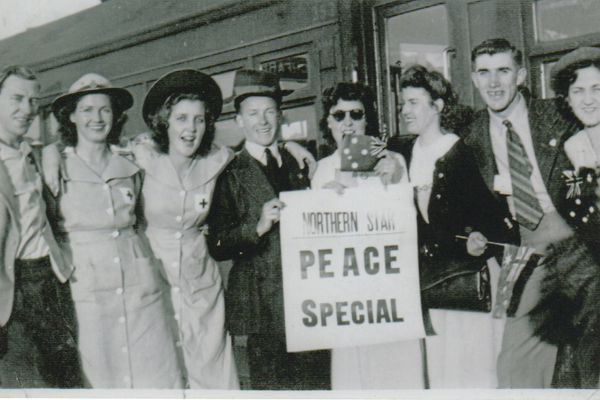 Once upon a time in the age of Aquarius, we rolled out of Central on the ‘Nimbin Good Times Express’. This was a special hired train on an Autumn night that clanked and clattered towards a northern festival in a tiny village in a hidden valley in the fields of rainbow’s end. Hundreds of hairy students and artists and dancers and dreamers, hippies and yippies rode those purple hours in an antique train made of iron and steam and smoke. In old compartments of leather and wood and brass we turned out the lights, lit candles, lamps and lanterns, painted the windows, some painted each other, hung curtains and sarongs, and we sang songs to mandolins and dulcimers and tambourines and drums. ‘Twas a strange and wondrous journey we’d never done before, and the guards hid in their carriage, and the driver and brakeman locked their door. It was a sleepless night amid the swaying lanterns; the shadowed figures wandering in and out of compartments and carriages; friends and strangers blurring in the smoke and talk and music. 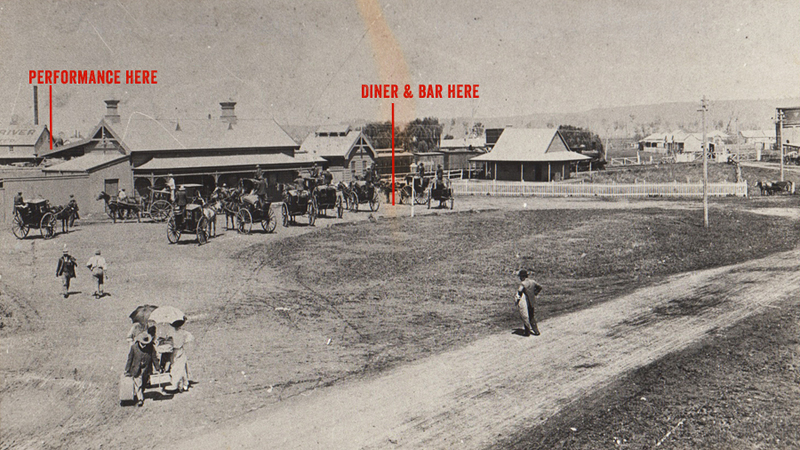 Through the moonless stations of the night thin blue lines of police began to appear on the platforms, fearing a student uprising at Dungog at 3am, or a revolution at Urunga at dawn. But we never opened the door, we never stepped ashore until the train lumbered late into Lismore, to be greeted by scores of gawking local onlookers, more police and the buses to shunt us to the festival. Something happened to us all on the train that night, and everything imaginable and unimaginable happened over the days and nights at the Aquarius Festival in Nimbin, the culture shifted, and many never returned to their towns and cities and universities; and Nimbin was never the same, nor Lismore or the Bay, or the rivers, and it all started on the train. Excerpt from reminiscences by Jean Vine, submitted for the Railway Wonderland first phase of development in 2009. “I was born in 1928 and spent the first 18 years of my life living in country railway refreshment rooms of country NSW, including Bathurst, Orange, Tamworth, Armidale, Wagga, Goulburn, Dubbo etc. My mother and father used to manage them when the steam trains were running. In 1938 there were no big trucks on the roads and everything used to travel by rail. The cattle and sheep were in carriages with rails on the sides and on occasions a new born lamb would be pushed out onto the platform, so I always had a pet lamb that I would dress in lambs clothes and a bonnet and put in my pram and feed it with milk in a babies bottle. Ben Chifley a former Prime Minister used to be an engine driver and he would come in with his billy to get hot water for his cup of tea. Sometimes the train would only stop for a short while so customers would pour their cup of tea into their saucer, so it would soon be cool enough to drink. During the depression swag men would come to the back door and they would be given any left over food. 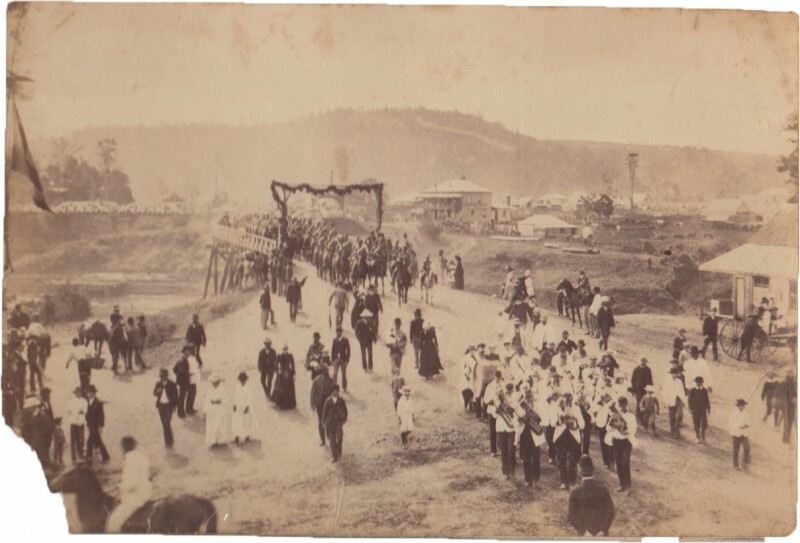 The partially completed railway line from Lismore to Murwillumbah was opened with much pomp and ceremony on May 15, 1894. The opening attracted crowds which swelled Lismore’s population threefold, with about 9000 people on hand to see the ceremony. Ships travelled from Sydney and Grafton for the occasion, and more than 1000 school children marched in the procession before the opening. Vessels from throughout the colony jammed the wharfs in Lismore. 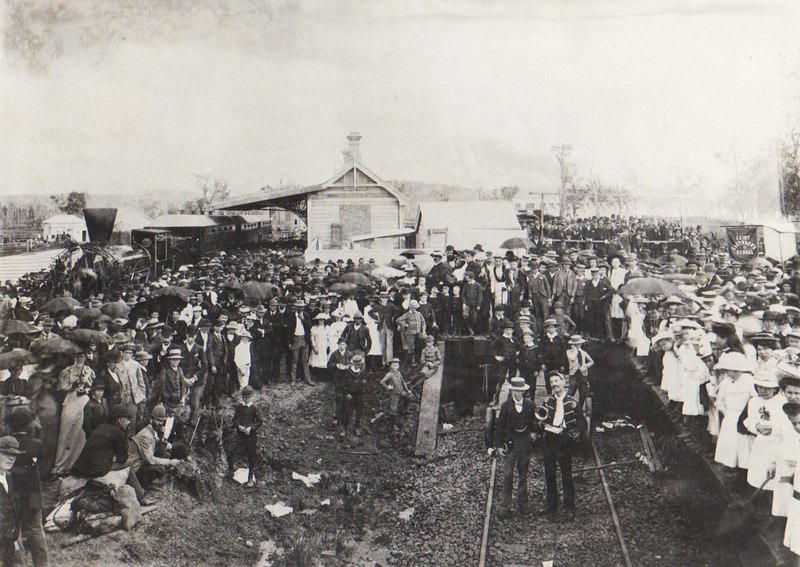 The Lismore to Murwillumbah line was used extensively to move freight, and the journeys were slow affairs, with many stops to pick up or put off freight. Logs, sawn off timber, sugar cane, general goods and cream, were all carried by the railway. The kerosene lamps often faded, and regular travellers brought their own candles for night trips. 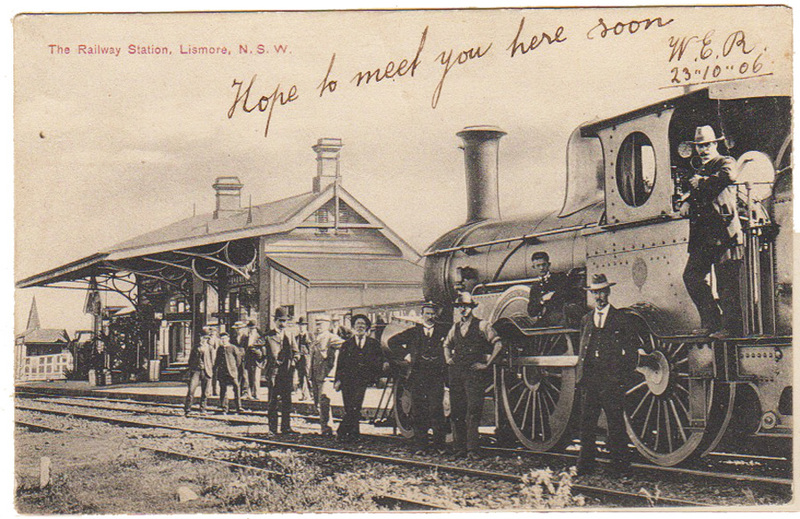 Above: Public photo at Lismore train stations early 1900s. Look at all the Saint Carthages students on the right!